As the festive season culminates in the onset of the New Year, we might invariably find ourselves ritualizing these transitions and celebrations with food and wine. Food is a necessity for our life and eating is a quintessentially primal activity whose roots lie deep in our evolutionary past. The ingestion and digestion of food is a nonnegotiable activity that is intimately weaved into the very rhythms of our daily lives and is an important arena of gratification where we relate and bond with others. Food has been articulated as a life giving force in numerous traditions, from Ayurveda, Chinese Medicine to coeval nutritional science. Moreover, a significant number of the world’s cultures and religions have sacaralised the act of eating. From a biological perspective, our bodies need the right type of food to function properly as diseases and compromised health conditions have been scientifically linked with malnutrition. Furthermore, individuals suffering from diabetes, cholesterol, heart disease, obesity, neuro-endocrinological disorders, digestive issues, cancer, kidney and liver disease all need regulated diets. In such circumstances, paying attention to the act of eating invariably starts taking on more importance than simply filling one’s stomach with tasty bites and is central to our health and well being. Getting to know our subjective sense of hunger then becomes an important part in consciously eating. Understanding how we eat, when we eat and why we eat is necessary to correct our unstable relationship to food. Conventionally, hunger is understood as a physiological drive, which underscores an organic void or depletion within us signaled by a fall in blood sugar or a rumble in the stomach, indicating that the body is in need of nutrition. Yet, in a deeper sense hunger is an existential state that drives one consciously and unconsciously to want to eat food and functions on multiple levels from biological to emotional to spiritual. Today, satisfying the polysemic phenomenon of hunger, in urban metropolitan areas has become increasingly easier due to the 24/7 accessibility we have to food. Over appreciating the value of the instant gratification good food provides us, our post-modern psyche has imbued food with a relevance that goes beyond physiological survival, making it food a principle source of pleasure and comfort We eat sugary, fatty, fried and salty foods not to fill our stomachs only but to help us deal with stress and assuage other disturbing emotions such as depression, loneliness, boredom, anxiety and anger. Eating, as the pursuit of comfort, in a fast paced, hyper stimulated and highly pressured epoch, becomes a coping mechanism to face the numerous demands made on us on a daily basis. Behaviorally this is more common than not. Have you every sat in front the TV or in the cinema with a tub of popcorn or some other snack and have ploughed through the whole thing in the course of the film? Or been at a cocktail party sipping a drink and chatting with a friend while devouring bowls of nuts and chips? Or polished off a whole bar of chocolate while sitting front of your computer screen trying to make our work deadlines? In such instances we are not realizing how fast or how much we are eating. This is called mindless munching or the act of grinding down edibles with a mind contemplating everything but the food one is eating. An antidote to this would be to mindfully observe and understand our experience of hunger and by that token our relationship to food. 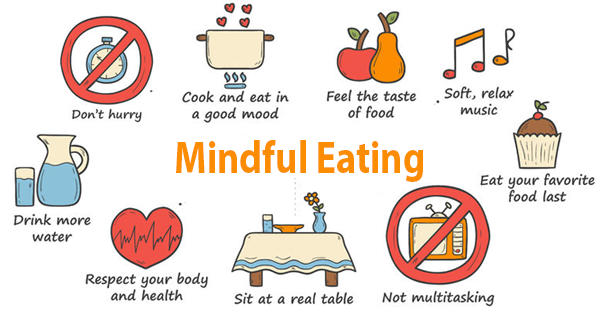 By being “mindful,” one pays nonjudgmental attention to the moments when and why one wants to eat, the food one eats and the act of one’s eating. By being focused on how we feed ourselves we can aid a more sophisticated self awareness of ourselves and our subliminal desires and drives that motivate us to eat as well enable a balanced relationship to food and body size. The reasons why we over eat, starve, grow fat, become skinny or on a more severe note become anorexic, bulimic or obese have a lot to do with how we are psycho-emotionally processing our sense of self and the stresses we encounter. Hence it is very imperative to pay attention to the emotional states behind one’s eating habits and working with them if they are disturbed. 1) Before eating do a baseline self- check on your hunger level before eating. Ask yourself where do you feel the hunger? How hungry are you?